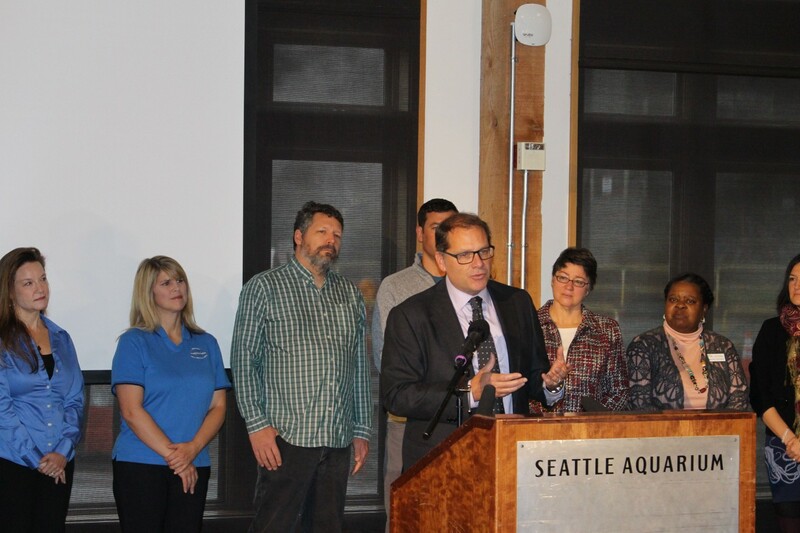 Washington State Legislators Sen. Kevin Ranker (D-Orcas Island) and Rep. Strom Peterson (D-Edmonds) recently held a press conference at the Seattle Aquarium, and were joined by the Surfrider Foundation and a coalition of advocates in support of the “Washington Reusable Bag Act” to announce they are introducing companion bills in January, 2019, at the state legislature to address plastic pollution and recycling contamination due to plastic bags. The reusable bag legislation will build off the existing 23 local ordinances already in place in the state of Washington. The coalition organizations supporting this policy include: Environment Washington, Puget Soundkeeper, Seattle Aquarium, Surfrider Foundation and Zero Waste Washington. 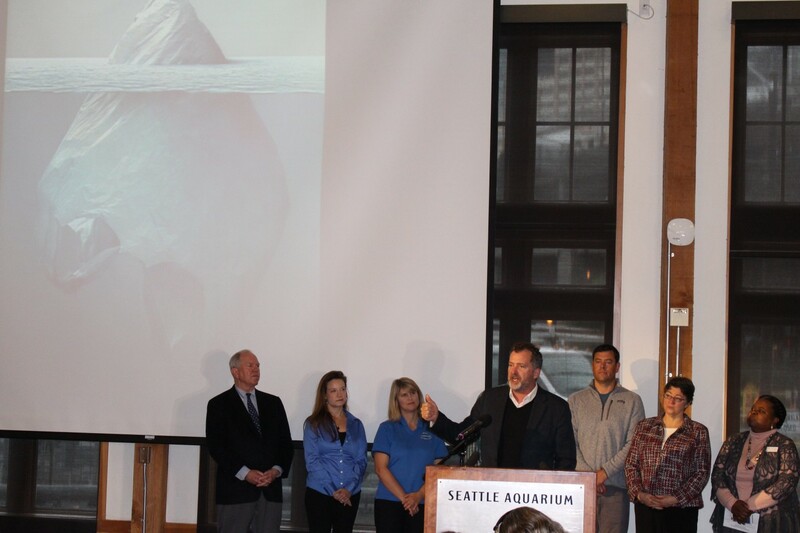 Washington State Represenative Strom Peterson speaks at the Seattle Aquarium along with coalition partners. Photo credit Seattle Aquarium. Surfrider Foundation Washington chapters have been active leaders on this issue in Washington for many years. They have helped to pass plastic bag ordinances at the local level, most notably playing a lead role in the city of Bellingham, which served as a model for other communities. The chapters have also played a key role in the passage of a bag ban in the city of Tacoma. Plastic bags are problematic in the litter stream because they float easily in the air and water, traveling long distances and never fully breaking down in water. Plastic bags are used for minutes, pollute for years and are among the top 10 most common items found in coastal cleanups in Washington and around the world. They also pose a huge operational and contamination problem at recycling facilities, requiring workers to cut the bags out of clogged machines every day. Cleanup of plastic debris and waste is also costly. Public agencies spend more than $500 million annually in litter cleanup. The Bag Monster even made an apperance. Photo credit Seattle Aquarium. 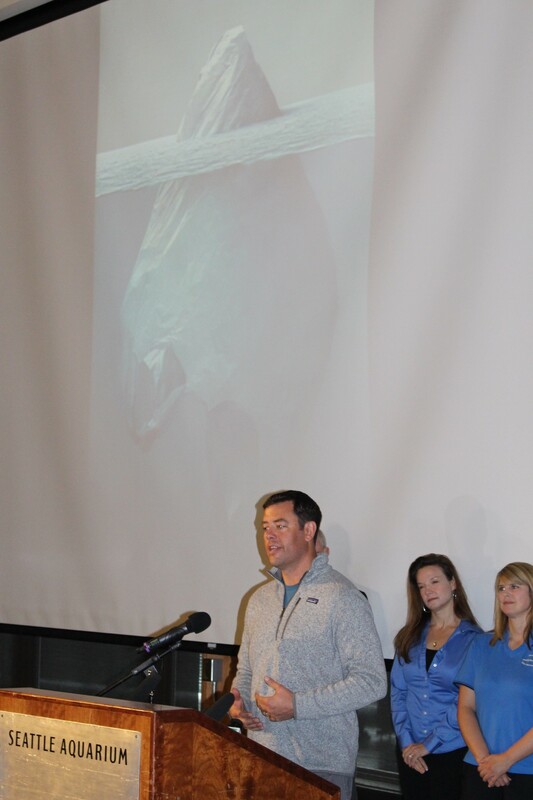 At the press conference, state legislators and coalition partners made a strong case for the need for a Washington statewide plastic bag ban. The event garnered wide media coverage including the Seattle Times, King5, as well as a great editorial from the Everett Herald. Washington State Senator Kevin Ranker and coalition partners. Photo credit Seattle Aquarium. Washington Policy Manager Gus Gates and representatives of the NW Grocers Association. Photo credit Seattle Aquarium. “Plastic bags are one of the top 10 items we find every year at beach cleanups in Washington and around the globe. Eliminating this chronic source of plastic pollution will go a long way towards keeping our beaches and aquatic ecosystems in Washington clean,” said Surfrider’s Washington Policy Manager Gus Gates. Surfrider Foundation Washington chapters are working to follow in the footsteps and build upon statewide legislation that has passed in California and the Hawaiian Islands. 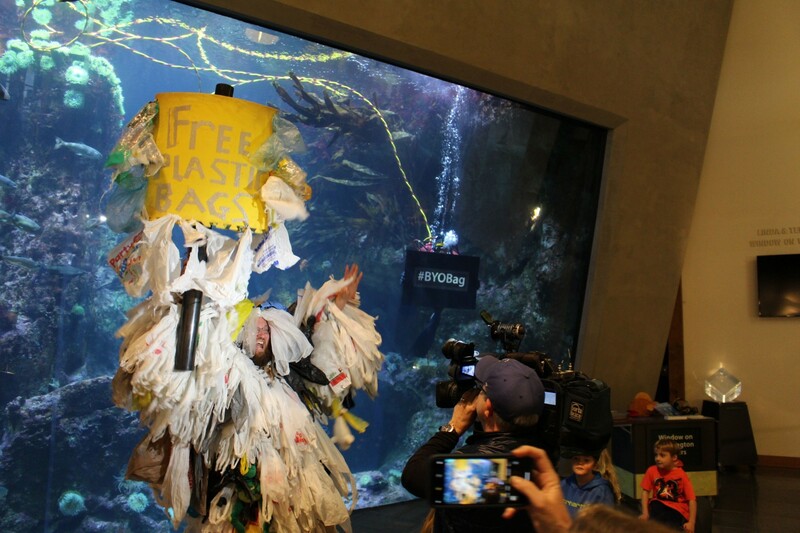 If passed, the “Washington Reusable Bag Act” would put the state on the map as a leader in the fight against plastic pollution! Refuse single-use plastic and live an ocean-friendly lifestyle! 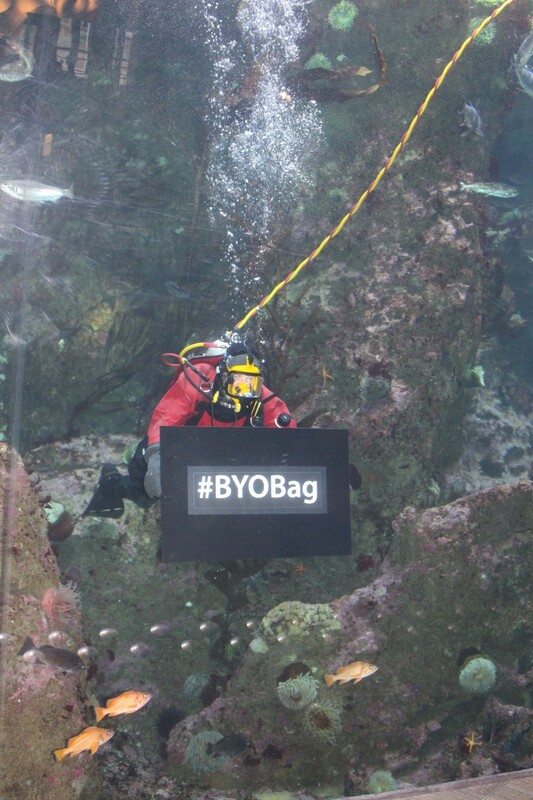 Seattle Aquarium volunteer diver reminding attendees to #BYOBag. Photo credit Seattle Aquarium.